Students hold signs and wear red to march to the district office and protest the district's refusal for teacher raises. With the cost of living steadily increasing in Fremont coupled with the previously failed salary contract negotiations between the teacher’s union, FUDTA (Fremont Unified District Teacher Association), and FUSD, teachers of all levels across the district have declared a state of work to rule. Work to rule is FUDTA’s negotiation tactic where, instead of striking, teachers and other employed professionals—counselors, nurses, psychologists, and program specialists—do the bare minimum of their required employment contract. At the recent Wednesday board meeting, after hours of heated anecdotes and requests from students, teachers, and parents, the union and the district’s closed session conversations once again did not yield an agreement regarding the salary contract for the year. This ensures that work to rule will remain until the end of the year and potentially into the fall of the upcoming school year. Mainly enforced by social pressure among teachers, work to rule at Irvington translates to teachers working strictly from the designated hours of 8:00 to 3:05, excluding lunch. Many teachers across the district dedicate their time outside of their paycheck in writing recommendation letters, advising clubs, and preparing lesson plans both during the summer and school year. In their collective stance in work to rule, the teachers aim to highlight how much of their volunteer effort is unpaid. FUDTA’s goal is a 2% salary increase or COLA, cost of living adjustment, for all teachers and learning professionals listed above in order to match the high cost of living in Fremont and the Alameda County. Alameda County is the sixth most expensive district in California out of the total 58 counties. In the Bay Area inflation has skyrocketed to an annual rate of 3.2% from last year. Many teachers are forced to find housing elsewhere, in distant cities such as Santa Cruz, Tracy, and Livermore. Over the years, teachers leave the district, creating what many consider, a “revolving door,” in which new teachers come into the district to develop their skills and styles and then leave due to rising prices. Not only is the cost to rent and purchase homes at an all-time high in Fremont, staff members of the district also have trouble paying for insurance and medical costs. While most teachers in the country have benefits as part of their contracts, in the 1990’s the teachers’ union voted to have the money for benefits put into their salary such that they could pay for their own health care. Many teachers at the Wednesday board meeting also admitted being unable to afford insurance due to stagnant wages. The ongoing negotiation between FUDTA and FUSD about the COLA pay has lasted over a year. FUDTA moved to work to rule after months of organizing parents and students, distributing leaflets, speaking at board meetings, and emailing the board and Superintendent to come to the table with a more sustainable offer. While FUDTA remains adamant for their 2 percent increase in wages, FUSD has offered a 1.33 percent one time stipend in wages. The teacher’s union refused this one time stipend, instead asking for a more sustainable pay raise to match climbing living costs. The district also attempted to settle the matter by giving compensation for PLC hours which the district reports 90% of Fremont teachers participating in. PLC, or professional learning community, is a per-school group of teachers who regularly meet, share expertise, and work together in order to improve teaching skills and the academic performance of students. “Teachers who opted in to PLC work were paid their hourly rate for the hours worked; more pay for more work is not a raise,” Bullard said. However, FUSD stated that although their best intentions are with teachers, the district currently does not have enough money to allocate to the increased salaries. Until the late 1970’s, school districts relied mainly on local property taxes for revenue. However, Proposition 13 significantly limited the amount of revenue districts could receive from property taxes. As a result, a majority of FUSD’s money, around 60 percent, comes from the state. According to FUSD superintendent Kim Wallace, FUSD is ranked 18th out of the 18 districts Alameda county for state and local funding, and California is ranked 46th in the country for per-pupil spending. Thus, after months on end of negotiations, work to rule is the last resort for teachers before the strike. Work to rule has adversely affected students, with less time to approach teachers before finals week and the prospect of all clubs being shut down because of a lack of a teacher advisor. 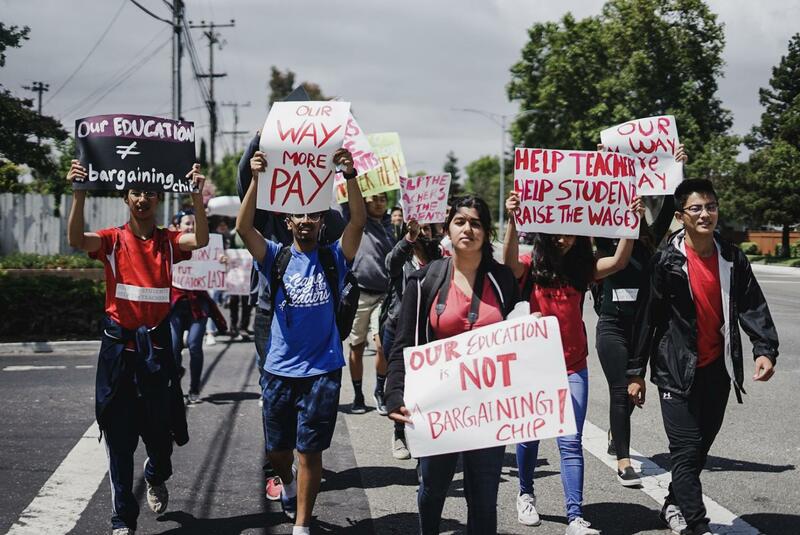 In response, a group of students—Fremont Students for Educators—prepared posters and fliers and organized a walkout at 2:20 on Wednesday, June 6, in which students marched from Irvington High School to the school district office. While most walked to show support for their teachers, others also voiced dismay with being caught in the middle of the conflict between FUDTA and FUSD. The administration was aware of the walk-out, and police officers patrolled specific routes to ensure student safety. Over 50 students from Irvington walked out, later joined by around 40 from Kennedy High School. While some students donned red in support of the teachers, others protested with signs that read, “Cuts to Education Never Heal” and “You Can’t Put Students First if You Put Educators Last.” These students walked to the district office, and some spoke at the open session about the impact of the recent Work to Rule and the importance of teachers. With clubs, grades, and recommendation letters all at stake, students are worried about the prospect of work to rule this coming fall. Furthemore, teachers all across the district remain unsure about the upcoming school year and, more importantly, the status of their salaries.